Keeping up with the technology that powers kids’ lives is a challenge. In the classroom, it is no different. New technology tools are empowering schoolteachers to present ideas and information in exciting new ways. To children, most of these innovations are intuitive, but sometimes it takes a little longer for the adults to catch up on the learning curve and begin using the tools for teaching. So-called smart classrooms are only as smart as the people who use them. That’s why St. Joseph’s College sought out, and won, grants that will allow them to build an on-site smart classroom for pre-service teachers. Founded in 1916, St. Joseph’s College has a long history of graduating future teachers and administrators of New York’s children. 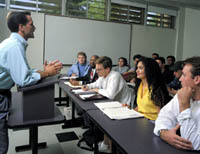 The Long Island campus serves about 3,000 students, one-third of whom are Child Study majors. There is also a Brooklyn campus, home to the renowned Dillon Child Study Center laboratory school for preschool and kindergarten children. Students in the Child Study major work closely with children and make classroom presentations about their observations and research. For now, they rely on a rolling technology cart to back up their presentations. Next year, however, as part of the college-wide implementation of smart classroom technology, there will be a dedicated smart classroom for pre-service teachers. This classroom will contain the sorts of technology tools the students are likely to encounter in their future K-12 classrooms. The plan is for each smart classroom to support LCD projectors, VHS and DVD players and recorders, a Polycom videoconferencing system, a satellite download interface, and a teacher station equipped with a flat screen monitor, CD and DVD burners, SmartBoard, and white boards that will replace the traditional blackboards. College staff will train campus users on the various tools. Reports from educational organizations such as the National Education Association and the National Council for Accreditation of Teacher Education point to a deficiency in preparing future teachers to us technology in the classroom. The teach-the-teacher classrooms at St. Joseph’s College will facilitate new approaches to introducing and presenting concepts, using a range of multimedia and online tools. As a result, students graduating from the St. Joseph’s program will be up to date on the latest technology, with the skills and experience to handle everything that’s available to their future charges in the public schools. For more information, contact Amy Kerrigan at St. Joseph’s College: akerrigan@sjcny.edu or (718) 636-6880.